Part 2 of the “B” ticket series will cover 1975 thru 1978, four years that saw many changes at the Farm. 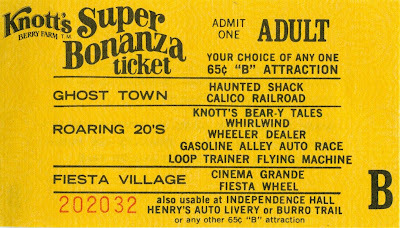 As you may recall, from the late 1960’s thru 1974, Knott’s only had the “A” and the “B” ticket. 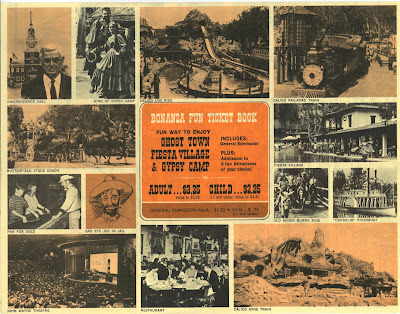 The Knott’s family was getting very ambitious in the early 1970’s, new themed area’s and many of new attractions. As proof of this rapid expansion the ticket book went from 1974 having A-B to 1975 having A-B-C-D. 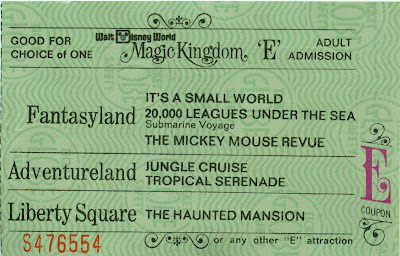 The entire look of the tickets also changed and they sure look at lot more like the kind the mouse uses…. 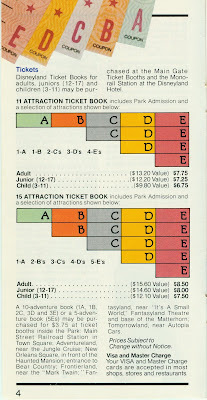 Due to the fact that there are now 4 ticket type’s versus just 2, the attraction lineup on this May 1975 “B” ticket is almost completely changed from 1974. The only attraction remaining on the “B ticket is the “Fiesta Wheel” in Fiesta Village. From Ghost Town the “Haunted Shack” and “Calico Railroad” have moved in, down from the “A” ticket. 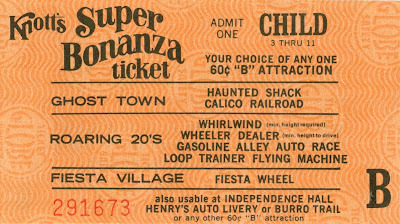 In the “also usable” category; “Independence Hall”, “Henry’s Auto Livery” and “Burro Trail” all moved down from the 1974 “A” ticket as well. 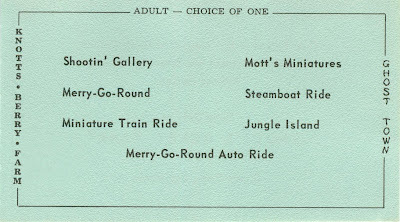 The New Roaring 20’s land had two new attractions. 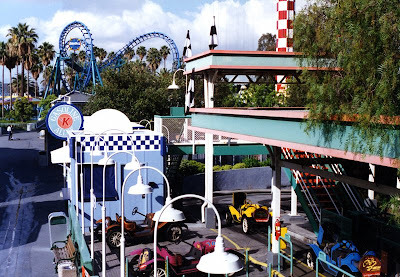 The “Whirlwind” a Himalaya ride, later renamed “Greased Lightning” (you’ll see on a “B’ ticket in part three) And “Wheeler Dealer” bumper cars that I believe are still at Knott’s. 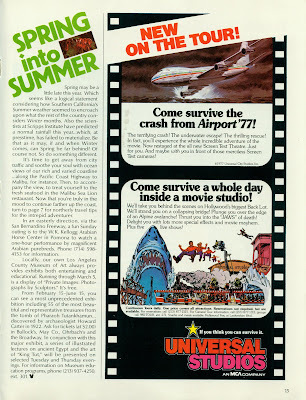 May 1976 finds two more new attractions for Knott’s Roaring 20’s land. “Propeller Spin” this is a “Roundup” (link) And “Loop Trainer Flying Machine” a “Schwarzkopf Enterprise” (link) both of these spinning wonders were removed in 1989. "Whirlwind" and "Wheeler Dealer" now show “min. height required” don’t panic, this printed requirement will be gone in 1978! This Child “B” is from May 1977. Missing is the “Propeller Spin”, moved down to the “C” ticket already. See more info about this ticket below. And Chris had a link to this picture, thanks Chris! 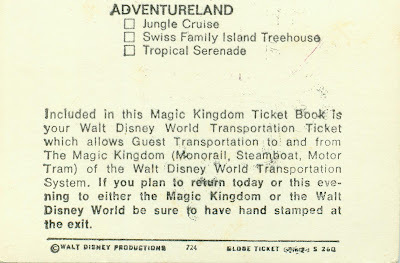 Last ticket for today, from May 1978. First notice its 65 cents now, darn inflation of the late 1970’s! 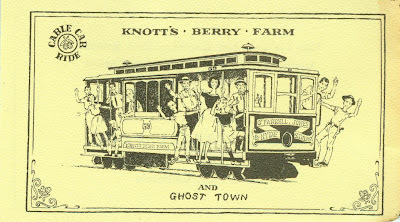 “Knott’s Bear-y Tales” had moved down the country road from the “A” ticket. 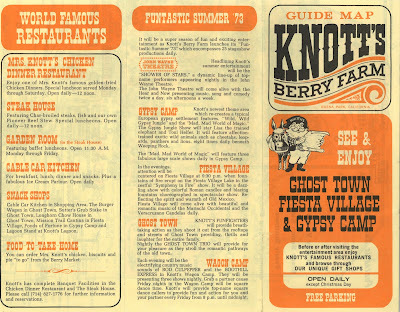 See a GREAT post about Knott’s Bear-y Tales at Outside the Berm (link). Also added to Fiesta Village was the Cinema Grande removed in the 1980’s. Back in the days when everyone gave out matches! Even the matches were promoting the new Roaring 20’s area! 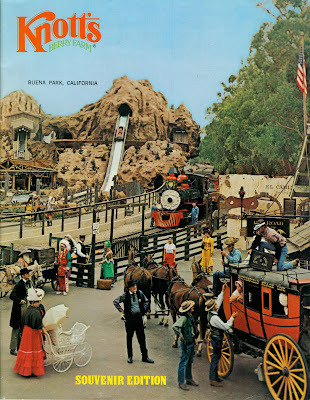 Here is the cover of an amazing Knott’s Souvenir Edition guide book from 1975/76. This is the finest one of these I have every seen. 35 large pages, all color, zillions of photo’s, great text, nice clean layout, outstanding overall. I will have the entire guide available this coming Bonus Sunday. Knott’s fans be sure to check back later this week. 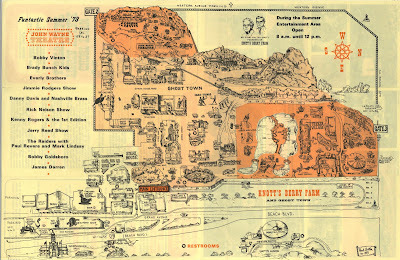 We will be having a Knott’s Map Comparison Blowout! Eight high resolution scans of the LARGE maps from 1951 thru 2005. A simple Sunday Bonus Today. 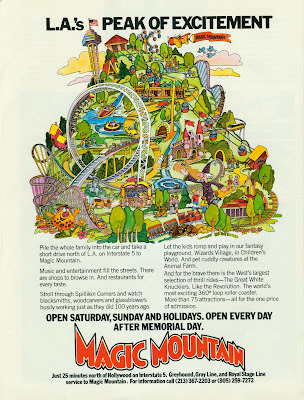 From Spring 1978, a nice "Vacationland" magazine. The style and looks of these magazines certainly changed over the decades. By 1978 it looks much more professional, much higher production values and lots of COLOR! This issue has a fantastic multi page layout on the West Coast "Santa Barbara to Monterrey" super photo's and very well done. 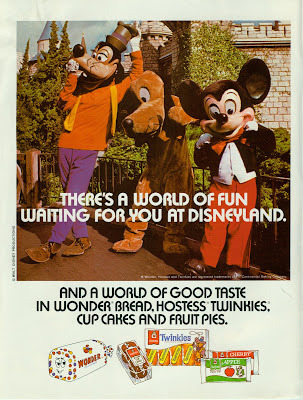 Lots of ads, and some really neat Disneyland articles too! Check out the cover! That's a stellar photo's, nice "depth of field".... It reminds of some of the fine slides I see on the Great Slide Blogs! 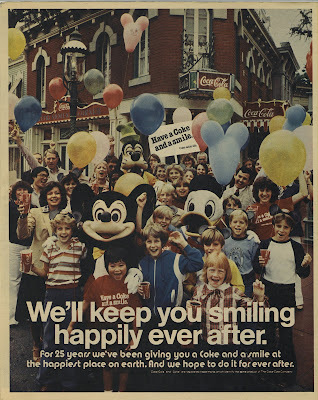 Set your time machine back exactly 28 years from today and you can come to the party, the “Family Fun Party" at Disneyland March 29, 1980. Upon closer inspection the ticket technically should be called “Family Fun Party Night” but that doesn’t sound right. 7pm till Midnight, unlimited use of all attractions (except shooting galleries). $7.50 for five hours on a Friday night. I’m going to guess the park was also open to “regular” guests as the ticket makes no mention of a “private” party. How good of a deal is this? 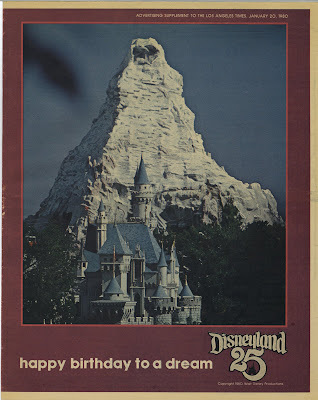 Let’s look at the ticket prices from the 1980 Disneyland Guide. For .25 cents more you can get an 11 attraction book or for a $1 more you can get the 15 attraction book and with either you get to stay all day. So do you think it was a better deal to just get a 15 book? 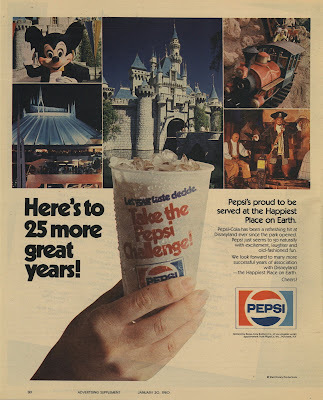 As a special Saturday Bonus to go with the 1980 Family Fun Ticket, here is a 1980 Los Angeles Times Supplement “Happy Birthday to a Dream” Disneyland’s 25th! Scanned on the BIG scanner this 32 page supplement is done in newspaper format “Magazine Style” with each page measuring 10 ½ by 13 ½ inches. It has faded a little as it’s just regular newsprint paper. But it's still fun to look at. The post is over, please set your time machine back to the present or what ever time you like…. This post was going to be on March 3rd, but I totally forgot about it. 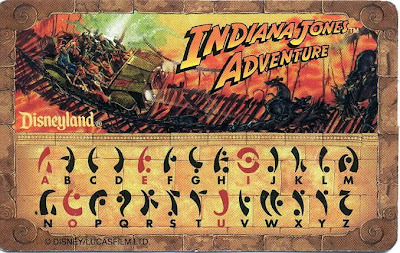 March 3, 1995 was Disneyland's grand opening of "Indiana Jones Adventure: Temple of the Forbidden Eye" Was this the last big all NEW "E" ticket attraction opened at Disneyland? The Rocket-Rods don't count. 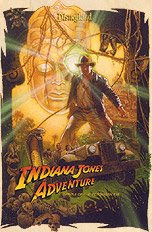 With "Indiana Jones and the Kingdom of the Crystal Skull" coming out this May 22nd, I am surprised Disney isn't doing a massive tie-in and update to the attraction. Maybe they are waiting to see if the movie does well, the trailer sure looks great! This ticket is HUGE, just like the ToonTown Commemorative ticket (link). The stub is only a inch and a half. Are you supposed to carry the rest of this foot long "eternal treasure" around all day? Oh, I know, rent a locker for it! The art work is pretty cool and that Snake slithering around the ticket is effectively scary... "Snakes, why'd it have to be Snakes?" The back has some fun sayings... And some strange unrecognizable symbols? How will you ever figure out what it says? 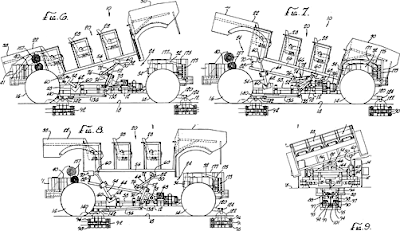 Neat patent diagram (link to actual patent) for the ride vehicles. This almost has a 1890's look? I always knew the "Chamber of Destiny" was really only one door with one corridor behind it. I was just never quite sure how it was done. Click on this moving .gif file it show hows it works, clever. 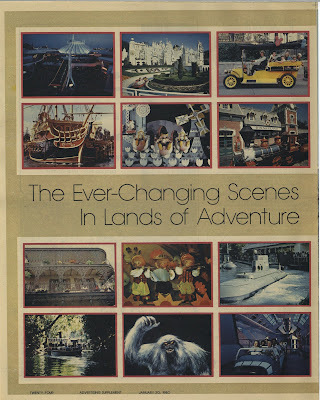 Thanks for visiting my blog today, "You have chosen Wisely"
Looking back to February's post on the first Walt Disney World 1971 ticket book. (Link). That post was missing a 1971 "E" Ticket, I had shamelessly substituted a 1972 "E" ticket because I didn't have a 1971 version. Now we got one! It came in a group of WDW things I won on EBay, I didn't even think there would be a 1971 Booklet in the bunch and with an "E" ticket!. The "Hall of Presidents" and the "Country Bear Jamboree" will move UP to the "E" in 1972, they start off in 1971 on the "D" (see 1971 "D" below). The "Mickey Mouse Revue" will move down to the "D" ticket in 1972. This one was news to me, In 1972 the "Tropical Serenade" will become the "Enchanted Tiki Birds" and move down to the "D" ticket. 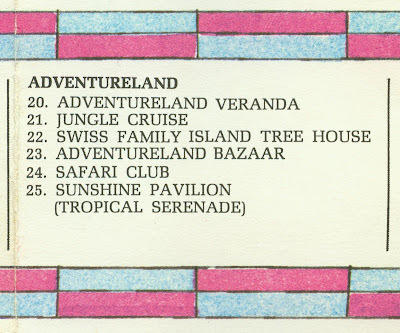 From April 1972, Adventureland has the "Tropical Serenade". September 1972 shows the name change to the "Enchanted Tiki Birds". All that stuff above about the transportation ticket is missing from this book because this is a "in park" ticket book only, no admission or transportation tickets included. This is from a HUGE wall map I have of Walt Disney World. 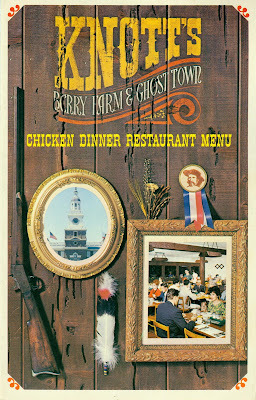 I think it's the first one, it's not dated, but I have studied it well and it's very early WDW. 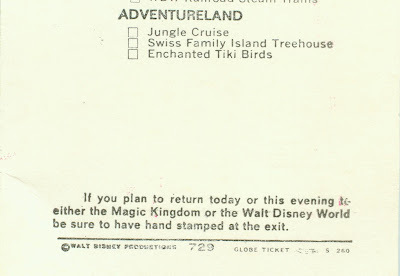 Here is the Adventureland listing section. Apparently the (Tropical Serenade) is in the Sunshine Pavilion. Here is the section of the map showing the "Tropical Serenade" (#25) right in the middle. This map is done in fun style, I like it. I was going to try and "paste" this BIG wall map together from multiple scans, any suggestions on what software to use. I am using Corel Draw 9 now (don't laugh, it was free...). 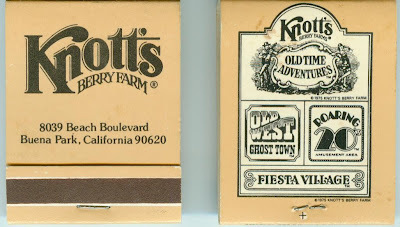 Remember that Knott's Lettered Tickets are valued in the reverse order from Disneyland's. Knott's "A" ticket is the top of the line, whereas Disneyland's "A" ticket is the lowest value. Also keep in mind that from the late 1960’s thru 1974, Knott’s only had the “A” and the “B” ticket. As you’ll see, they were starting to get full. Today’s post will cover thru 1974. Here’s our classic 1960’s family again, Dad with his pipe forever parked in his mouth (while smiling of course!). 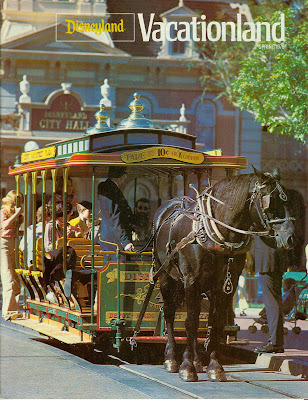 This book is not dated, but I would place it around 1968, no log ride yet. Of course these first tickets sold in books were not lettered at all. 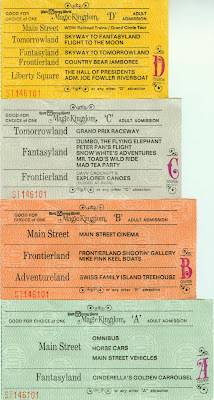 But I still call these “B” tickets as these are obviously for the lesser group of attractions. These all look fun to me, Mott’s Miniatures was pure magic to me as a five year old. The cable car got its own ticket in the book, not for long. Here are some older individual tickets from a prior post (link). From June 1970, It’s a “Knott’s Silver Dollar” Fun Adventures Ticket. A completely rearranged ticket now designated “B”. This ticket now covers the cable car too! Missing is the “Miniature Train Ride” interesting since it still appears on the map. The "Merry-Go-Round Auto Ride" is now gone, was this the “Children’s Model T Ride” shown in the first map below? Howdy Cowboy! See ya! Your stay on the “B” ticket is very short. It’s May 1971 and Whittles has booted the Cowboy right off the “B” Ticket! The Cowboy seemed nicer… A new attraction, the “Happy Sombrero” one of the flat rides that spins and makes you throw up! Also, this is a “Child” ticket, hence its different color. 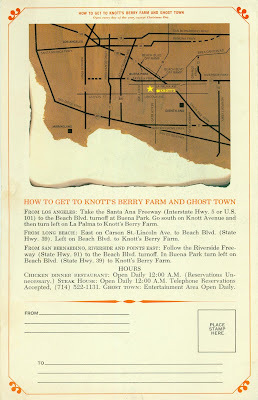 Gypsy Camp has joined Knott’s on this June 1973 “B” Ticket with the “Gypsy Shoot” I see it on the map but can’t tell what it is, a shooting gallery I would guess? Also new is the “Fiesta Wheel” more spinning rides! By the way, this ticket is NOT good for the Rowboats over in Knott’s Lagoon. 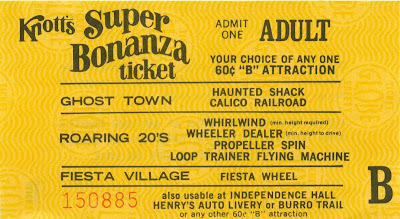 Hey, what’s this coupon doing in my 1973 Knott’s ticket book? Oh, it’s for Knott’s jams and jellies, great I’ll use it at the park today. WHAT, “Not redeemable at Knott’s Berry Farm”! I demand my 7 cents off! Here’s the back, in all its pre-barcode goodness…. 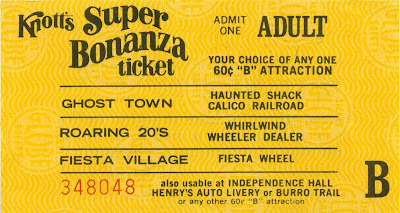 Last ticket today from September 1974, Whittles last appearance on any Knott’s ticket. The “Animal Farm” is now on the “B” ticket, the first downgrade victim, having been on the “A” ticket since 1970. 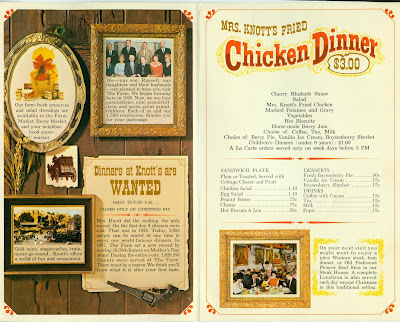 And for some color, here is a Knott’s Chicken Dinner Restaurant Menu. This is not dated, but the price corresponds to the first map in the prior post so I would place it around 1970. Wow, that was some cool stuff, I love Knott's tickets! Can you tell? Be sure to check out the maps below. I have lots more maps to post in the future. 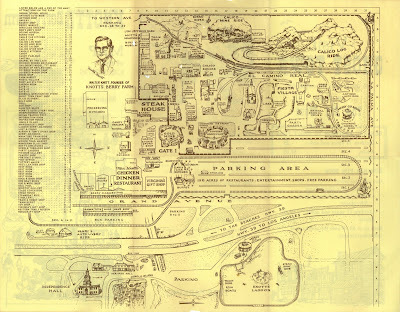 First, this Knott’s Berry Farm “Map of the Grounds” is not dated, based on the attractions and ticket book price, I will put it as 1970. If someone knows the actual year, please comment. 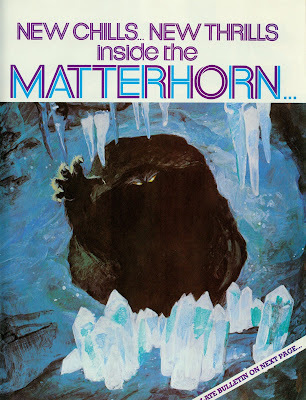 The Cover with Whittles the Prospector, please hide all small children! The back of this guy is fading away! 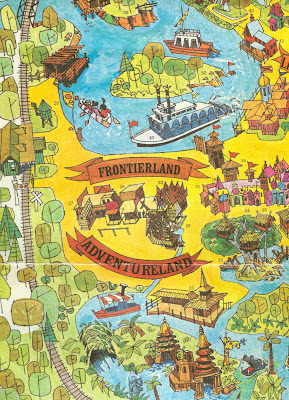 Now here is a map from the "Funtastic Summer 1973". This one is huge at 11” by 17” (scanned at high-res for your enjoyment!) It’s fun to compare this map with the 1970 one from above. Already a lot of changes, MANY more changes in the years to follow. What? The Brady Bunch Kids! "It's a Sunshine Day"
Here is the front, side and back of the 1973 Guide Map. Whittles has mule now and appears to be reading the map with us! And here his the back part before you fully open the map.